Recreate your own highly subjective and strange version of the CLEAN sound installation online … using my custom-built audio mixing tool! 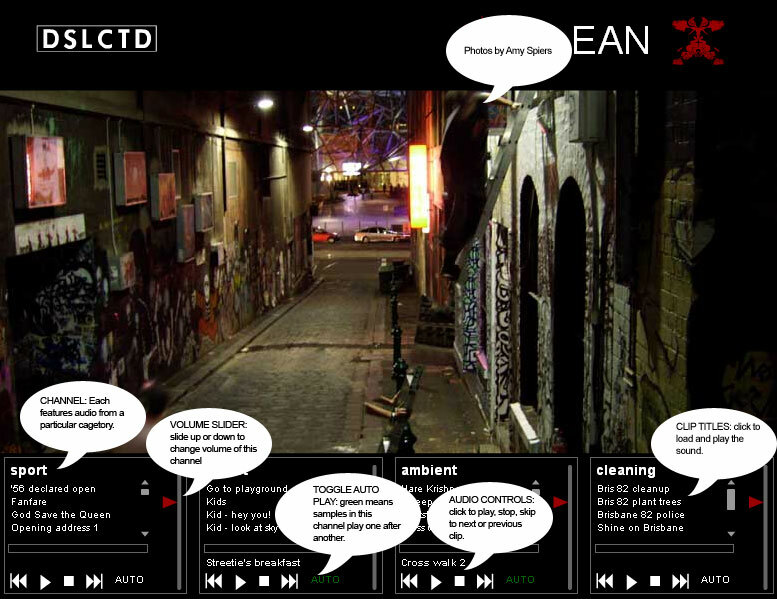 The audio engine takes a couple of hundred samples of the raw audio used in the project and, using an audio mixing interface, allows you to play with the sounds of Melbourne during the 2006 Commonwealth Games. Explore stories from the street, fanfares and race commentary from past sporting glories, cleanups, protests and a whole bank of random ambient sounds recorded in Melbourne’s late-night laneways. See the image below for an explanation of how it works. For more about the CLEAN Project, see the main entry here. NB: audio samples are from raw recordings rather than the final processed clips used in the actual installation; the sound clips are also fairly large so requires a quick connection to work properly. Feedback welcome on how it runs for you – it’s a bit of an experiment with using Flash to deliver audio.